We often underestimate the power that our collective spending habits could yield. If 25% of of Americans refused to buy non-union made shoes every major shoe company would at least offer a line of union made shoes and many local companies might have a chance at competing. I a global economy are dollar is, in a sense, our only vote. We cast our vote every time we make a purchase. Do we value sustainability, community, economic justice, non-violence? Do we know who makes what we buy? Where it comes from, and where are money goes after it leaves our pockets? 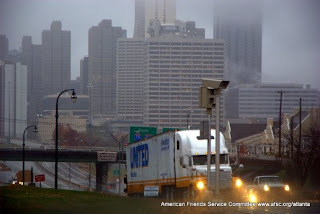 It was in this spirit that the Atlanta AFSC decided to organize what we hope is our first of many Holiday Mallternatives. Businesses, artists, and organizations that sell products that are locally made, eco friendly, fair trade, and fair labor were invited to participate. Around a hundred or so shoppers stopped by and purchased items that ranged from chocolate to t-shirts, books, to Palestinian olive oil, pecans to beach mats. All who come got to enjoy organic hot apple cider and sample fair trade chocolate and hickory smoked pecans. We even got a visit from Santa Claus, who came bearing gifts! "Eco-friendly gifts and decor from India"
"Decorative items*Cards*Artisan jewelry. Tarot readings"
"Hemp and organic cotten tee-shirts"
This organization also know a whole lot about permaculture, check them! "An independent feminist book store"
Thanks to everyone how can out and made it happen!!! We dropped a BIG postcard to Obama, hope he gets it! 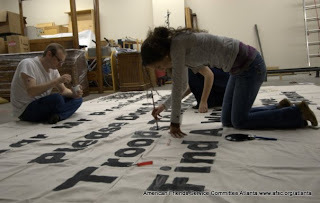 Wednesday December 2nd EARLY in the morning two committed teams met up and dropped large banners in two different locations around Atlanta. 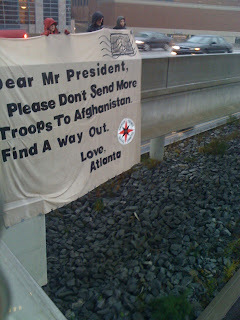 One resembled a giant 12x15ft postcard that read, "Dear Mr President, Please Don't Send More Troops. Find A Way Out. 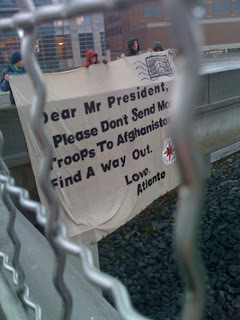 Love, Atlanta" It was dropped on the 17th street bridge and held for 40 minutes during peak morning rush hour. 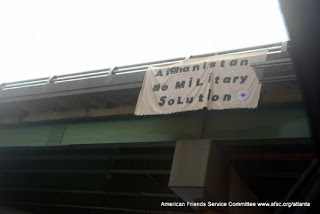 A smaller banner was dropped on the Jackson street bridge over Freedom pkwy. 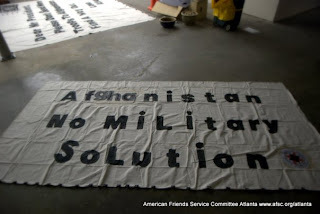 It reads, "Afghanistan, No Military Solution" and was tied to the railing. It's reportedly still there as of 1:20pm. 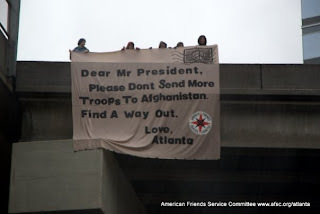 (Atlanta) (December 2, 2009) – The American Friends Service Committee deeply regret President Obama’s decision to send 30,000 more troops to the war in Afghanistan announced tonight. Since the war’s beginning in 2001, AFSC has urged the U.S. government to support diplomacy and an Afghan-led civilian reconstruction effort, rather than warfare, to build peace and security in Afghanistan and the region. Now, with a weak economy, the war’s financial cost alone – the Pentagon estimates that it costs $1 billion to send 1,000 soldiers – requires a reversal of the decision.